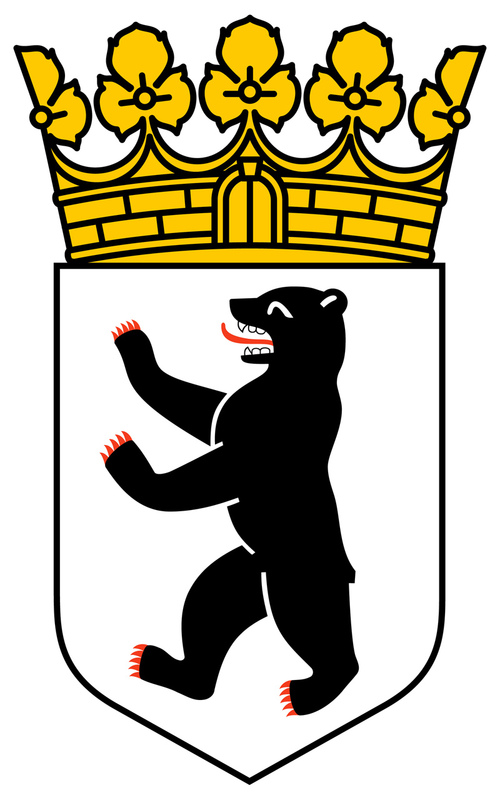 The Berlin Coat of Arms features a bear – the Berlin Bear. But how or why the Berlin Bear became Berlin’s coat of arms remains mostly unknown. Or actually there are different theories and all them seem to make sense. The city’s name Berlin is actually quite close to how you would spell ‘bear’. SO chances are, that the city is actually named after the Bear. But which bear? And why would you name a city after an animal? Most likely the bear refers to the first Margrave of Brandenburg Albert I who was also called Albert the Bear (‘Albrecht der Bär‘, 1100 – 1170). In 1132 he received the North Mark, east of the junction of the rivers Elbe and Havel from the Holy Roman emperor Lothar II. He founded the ‘Mark Brandenburg’ and ruled the area around today’s Berlin. It is not clear why he was actually called ‘The Bear’ – but the City of Berlin could actually be named after him. But that is just one of many different theories. On the other hand there were actually bears living in the area around Berlin. The very last bear was shot in 1741 in Brandenburg-Preussen, near the city of Stettin. So the City of Berlin could also be named after an actual bear. The ‘Bär’ would only explain the first half of the city’s name. The second half however is not so diffucult to explain: in old German language the ‘~lin’ would kind of underline the endearment, making the ‘Bear’ a ‘Little Bear’. So it could actually very well be, that the city is named after the animal. By the way: that would make the ‘Berlin Bear‘ actually ‘The little bear’s bear‘ – but maybe that’s now a little bit too philosophical. Anyways. On the other hand there is the theory that ‘Berlin’ actually originates from the Slavic word ‘Berl’ for swamp, which would also make perfect sense, since Berlin was originally built on rather swampy grounds . Again the ‘~lin’ would kind of underline the endearment, making the ‘swamp’ a ‘little swamp’. However – since around 1280 the bear is ‘the official animal‘ of Berlin.The current ‘Logo’ of Berlin was designed by Ottfried Neubecker (1908–1992). The ‘City Logo’ features a silver ‘shield’ (often white is used instead for practical reasons). A black bear with a red tounge and red claws, looking to the left. The shield is ‘crowned* by a combination of a wall and leafs. And then there are also some real, living Berlin bears. The first ‘generation’ was a group of four living Bears that moved in to a rather small bear pit near Märkisches Museum / Köllnischer Park in Berlin-Mitte in 1939. Three of them died during the war. Since then there always has been follow-up bears, often given by other countries as a gift to the City of Berlin. Please feel free to visit either the website of “Berliner Bärenfreunde e. V.” (German) to see some photos of the bears. There is also some further information available in English on the website www.berliner-baer.de. 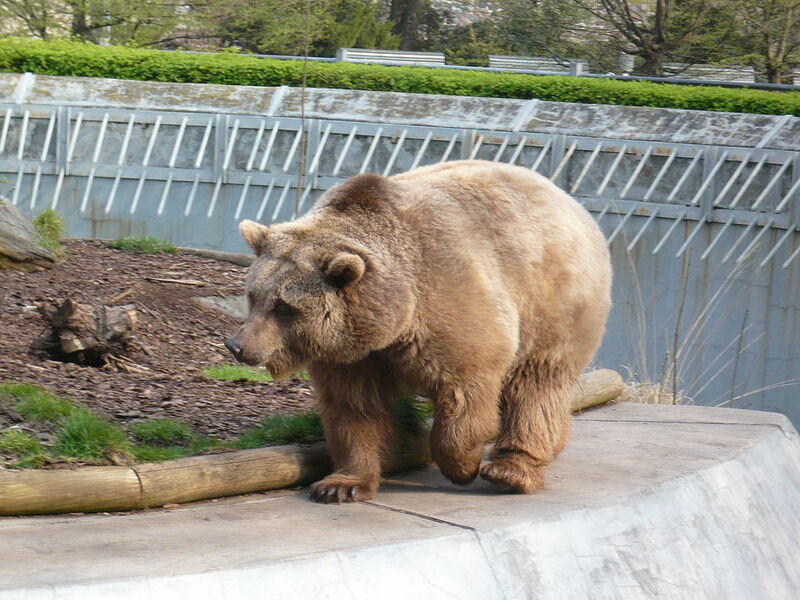 Or if you happen to be in Berlin you can of course also just go and visit the Berlin bears in person – on location. If you want to take the Berlin Bear home with you, you’ll have a large number of memorabilia to choose from: mugs, t-shirts, pens – basically everything you can print a bear on is available at any of the souvenir shops. Berlin’s ice hockey team is also called Berlin Ice Bears (‘Berliner Eisbären’). And then there is of course also a Hotel named ‘Hotel Berliner Bär’ in Tempelhof, right next to the Airfield of the former airport Tempelhof (www.hotel-berliner-baer.de). And that’s not the only one – at least on the island Rügen there is another hotel with the exact name, and also in the small town Lautenthal near the mountains of Harz there is another hotel with that name. And there’s also a restauraunt Berliner Baer in Beeville, Texas, USA. But it would probably too much to list all the restaurants and hotels, that are named after the Berlin Coat of Arms: The Berlin Bear.